Total Hardness refers to the amount of calcium and magnesium in your pool water. When total hardness is too high, scale can form causing the water to appear cloudy. When total hardness is too low, the water will corrode metal fixtures including copper components found in gas heaters and electrical heat-pumps. The total hardness should measure 150 - 300 ppm. Chlorine is a disinfectant designed to sanitize (kill disease-causing organisms) and oxidize (destroy ammonia, nitrogen-containing contaminants and swimmer waste). A disinfectant must be continually active in the pool water so that it may react instantaneously with bacteria, algae and other organic matter as they are introduced into the water. The level of active chlorine is called the free chlorine residual and should measure 1.5 - 3.0 ppm. Total Alkalinity measures the amount of alkaline substances in the pool water. Alkaline substances buffer your water against sudden changes in the pH. When the total alkalinity is too low, the water will corrode metal fixtures including copper components found in gas heaters and electrical heat-pumps. Low total alkalinity could also cause staining and weaken your vinyl liner, causing it to wrinkle. The total alkalinity should measure 80 ppm for swimming pools using granular chlorine, or 100 - 120 ppm for swimming pools using stabilized chlorine such as chlorine tablets. pH refers to the intensity of acid or alkaline materials in your pool water. pH is measured on a pH scale extending from 1 (extremely acidic) to 14 (extremely alkaline). A pH of 7.0 is considered to be neutral. High pH (higher than 7.8) can cause eye and skin irritation, reduce the sanitizing action of chlorine, and cause the water to appear cloudy. Low pH (less than 7.2) can cause eye and skin irritation and corrode metal fixtures including copper components found in gas heaters and electrical heat-pumps. The pH should measure 7.2 - 7.8. Cyanuric acid lengthens the life of chlorine in the pool water. Chlorine products that contain cyanuric acid as an ingredient are referred to as "stabilized chlorine". These types of chlorine are used to maintain consistent levels of chlorine in the pool water. But they are not very effective at clearing cloudy water or killing algae. For pools that use "non-stabilized chlorine", that is chlorine that does not have cyanuric acid as an ingredient, cyanuric acid should be added in the spring when the pool is clear and the water is balanced. The cyanuric acid level should measure 40-80 ppm. Pool water can turn cloudy for a variety of reasons. The most common cause of cloudy water is either dead algae floating in the pool water or other small particles floating in the water such as dissolved leaves. The best way to treat a cloudy pool is chlorine, chlorine, and more chlorine. You should add a large dose of non-stabilized chlorine (either calcium hypochlorite or sodium hypochlorite) each day for four to five days straight, keeping your free chlorine level above 3 ppm at all times and running the pool filter 24 hours a day. If this does not clear your water, then you can try clarifiers and other products. But first shock your pool water. Algae are microscopic plants which can transform your pool water from clear blue to a swamp in as little as 24 hours. Algae spores are introduced into the pool through the air, from rain water, and from swimmers walking across the grass and then jumping into the pool. Algae blooms are common after heavy rain showers and when the pool water temperature is high. There are many types of algae, the most common in our area being green algae, mustard algae, and black algae. The most effective way of preventing algae growth is to maintain a free chlorine level of at least 1.5 ppm at all times, run the pool filter 24 hours a day, and to add a dose of algaecide once a week. We have also found that adding Sun Algaecide to the pool water decreases your chances of suffering from an algae bloom. a Sun Algaecide acts as an inhibitor against algae growth by lowering algae's ability to process carbon dioxide in the water making it difficult for an algae spore to germinate and grow. If you do develop algae, apply the appropriate algaecide, shock the pool, and brush down the entire pool causing the algae to become suspended in the pool water. The next day, if anything settles out, vac it out to "Waste". If minerals are present in the pool water, they can cause the pool water to turn green, brown, yellow, and even purple. The water would look clear but discolored. It can be very difficult to distinguish between green water caused by green algae and green water caused by a mineral problem. A telltale sign of a mineral problem is the discoloring of the pool water shortly after shocking the pool. If this occurs, you will need to add a mineral sequester to the pool. Exactly how much is a guess. We have seen cases where one bottle has solved the problem, and others where multiple bottles were needed. Mineral problems are a tough nut to crack and the pool industry is just now trying to get a handle on it. 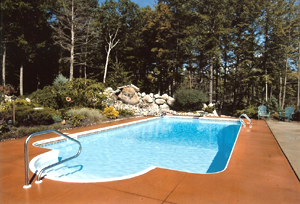 Stains on the vinyl liner are also treated by adding a mineral sequester. Persistent stains might need to be treated with an "on contact" product that must be applied directly to the stained area of the pool. If the stain is on the bottom of the pool, applying the product directly on the stain can be tricky, but possible. Due to the acidic nature of our tap water and our rain, we tend to suffer more from low pH pool water than from high pH pool water. Fortunately, correcting the pH balance of your pool water is quite simple. All you need to do is add pH Increaser (also called soda ash and base). But before you add pH Increaser be sure to get your Total Alkalinity balanced first. Once the Total Alkalinity is balanced, the pH can be adjusted more accurately. Spring Blowout Pool Sale!!! Save Big!!! Book Your Early Season Installation NOW. 14' x 28' 6 ft deep in-ground w steps & lite - $22,995 sale priced!! Above Ground Pools - up to $1000 OFF! Liner Replacement Sale - up to $800 OFF! Congratulations on your selection of one of the finest inground pools manufactured today. Download a copy of the owner's manual. © 2019 Sebago Lake Pools. All Rights Reserved. Financing only available to residents in the State of Maine.